Last Wednesday was an unusual day. It's rare for me to describe a day as "unusual." The Lord has placed me in a season of life when most every day is different from the previous day, and I can readily expect tomorrow to be different from today. What a blessing to live such a life! The day began with a 90-mile drive to Riverside, CA. My daughter, Marissa, was required to attend a regional meeting for children librarians and support staff. She could have made the drive herself, but I just didn't want her to drive all that way alone. So, I offered to drive her. She's quite the busy lady--about to graduate with her master's degree in library sciences, working full-time between two libraries, and planning for her wedding day later this year. Marissa is my middle daughter, which means one moment I want to ring her neck and the next moment I can't hold her close and tight enough. Although she would be in her meeting all day, the drive to and from Riverside, and then dinner together, gave me precious time with my daughter who has the prettiest brown eyes you will ever see. Of course, Marissa's all-day meeting meant I had the day to myself in Riverside. I spent some time working on a new sermon for the upcoming Attributes of God conference at Cazenovia Baptist Church (NY). The sermon, titled "The Love of God," is an exposition of 1 John 4:7-10. Needing a break (the seats at Starbucks are hard wood), I decided to spend the last couple hours in Riverside, on the corner of 6th and Main. There I stood, in 100+ degree heat, holding my cross. The Lord was very gracious, well beyond the small spot of shade He provided. I gave away several tracts. A few Christians happened by and actually encouraged me. I say "actually" because most Christians who approach me on the streets stop to tell my why they think what I'm doing is wrong and ineffective. The Lord further blessed me with conversations with three very different unbelievers: a devotee of Ellen G. White; a man, like so many of this present age, who had created a god in his imagination to suit himself; and David. David crossed the street and approached the corner where I stood. David was homeless. Yes I profiled him. In the heat, David's frequent consumption of alcoholic beverages was made evident as the sweat seeping through his open pores brought with it a familiar odor. His body and his clothes were filthy. As he stepped onto the sidewalk, I handed him a gospel tract and wished him a good day. He asked me to identify what I had just handed him. When I told him, he was quick to assert his belief in God. I soon learned that David has been an alcoholic for 36 years, since the tender age of 14. David served his country for several years as a member of the Navy. He's a phone technician, an electical wireman, by trade. But he's been out of work and on the streets for a couple of years. He has family who is willing to help him, including his octogenarian mother. I offered to buy him lunch, but he said he wasn't looking for charity. The conversation was cut short by the very sin I addressed with David--his pride. His pride kept him from getting help from his family. His pride kept him from taking day labor jobs he thought beneath him. His pride kept him from sitting down to lunch, out of the sun, in a cool restaurant. David insisted that his addiction to alcohol was the root of all of his problems. I told David his alcoholism was merely a symptom of a much deeper problem--his pride. David didn't like that. He said he didn't want to get into it. I told him he was already "into it" and that he would never get out of it until he repents and receives Jesus Christ as his Lord and Savior. David walked away with my gospel tract in his pocket--a gospel tract that would go where I could not go, a gospel tract that might speak truth into David's life when I no longer could. Once Marissa was out of her meeting, we made the long drive home to Santa Clarita. The plan was to have a nice dinner-for-two somewhere close to home, before calling it a day. Traffic was surprisingly light, which got us back into town earlier than we expected. Too early for dinner, we stopped at a local Starbucks to grab some water. As we walked toward the front door of Starbucks, I noticed a tiny, baby sparrow (pictured above) sitting on the sidewalk. Both the birdie's beak and feet were too big for its little body. There it sat--quietly, shaking a little, looking up at me. How Godzilla appeared on the big screen, I must have appeared to that little bird. I had Marissa run into Starbucks and, along with our water, bring out some napkins. I wanted to pick up the baby sparrow and get it off they 100+ degree concrete and out of harm's way, but I didn't want to cover the bird with my scent. If I contaminated the baby sparrow with my scent, if the mother should find her chick, she could reject it. Using the napkins, I gently picked up the baby bird and placed it on a limb, on a nearby tree. Marissa and I found the nest from which we believed the baby sparrow had fallen. It was high atop the building, nestled in a corner, just under the roof tiles. The tree in which the baby sparrow now sat was directly beneath the nest. After several minutes, I moved closer to check on the baby sparrow. It seemed lethargic. Not knowing how long it sat out in the sun, and thinking it might be a bit dehydrated, I used my straw as a syringe, filled the end with water from my glass, and put the straw up to the bird's beak. We were so excited when the baby sparrow grabbed at the end of the straw, then tilted its head back so that the cool water could make its way down the sparrow's gullet. The baby sparrow's eyes seemed to brighten and it began to chirp. Marissa and I backed away from the tree, hoping the baby's mama would hear her chick and come to the rescue. And wouldn't you know it? That's exactly what happened. Within a couple of minutes the baby sparrow's mother landed on the branch next to her chick and nestled close, as if to comfort her baby. The mother sparrow soon hopped out of the tree, foraged on the ground beneath its baby's perch, collected some food, and flew back to her baby's side. The baby sparrow's mouth agape, mama expertly and instinctively placed the food deep into the baby's throat. The mother sparrow did this several times. Then papa sparrow arrived. The trio chirped excitedly, as if they were as happy as, well, a lark. But, in all of the excitement, papa sparrow shook the tree branch and sent the baby sparrow tumbling to the ground. The fall was only about six feet, which didn't seem to faze the chick. Mama rushed to her chick's side and continued to feed it. The baby was now nestled under a small bush. The baby was safe from prying eyes and penetrating sun. Marissa and I decided that the baby sparrow was in good hands (wings), now. We headed to the restaurant with a spring in our steps. Two things came to mind as this memorable event unfolded. "I tell you, my friends, do not fear those who kill the body, and after that have nothing more that they can do. But I will warn you whom to fear: fear him who, after he has killed, has authority to cast into hell. Yes, I tell you, fear him! Are not five sparrows sold for two pennies? And not one of them is forgotten before God. Why, even the hairs of your head are all numbered. Fear not; you are of more value than many sparrows" (Luke 12:4-7). "Beloved, let us love one another, for love is from God, and whoever loves has been born of God and knows God. Anyone who does not love does not know God, because God is love. In this the love of God was made manifest among us, that God sent his only Son into the world, so that we might live through him. In this is love, not that we have loved God but that he loved us and sent his Son to be the propitiation for our sins" (1 John 4:7-10). 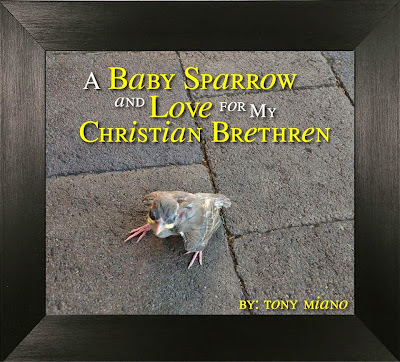 As I tried to help the baby sparrow, my mind was filled with thoughts of God's sovereign grace and the love I am called to have for my Christian brethren. The former, God does perfectly. The latter, I often fail to do. By helping that baby sparrow, I was saying, in effect, the baby sparrow had value. Yet God cares infinitely more for that little bird than I do. God cared enough about that baby sparrow to create it, give it a nest in which to live and grow, and provide rescue for it in its time of need. How deep the Father's love for the sparrow! How vast beyond all measure! As I picked up the baby sparrow and gently held it in my hands, I was deeply struck by the hands with which my Creator, my Father in heaven, holds me. My mind was a whirlwind of thoughts of the many, many times the Lord has physically, emotionally, and spiritually provided for me. And as I recounted these times, I quickly realized there were too many times to count when the Lord has lovingly provided for me and my family in ways that I never witnessed with my eyes. How deep the Father's love for me! How vast beyond all measure! I loved the baby sparrow. God loves the baby sparrow more. God loves the baby sparrow. God loves me more. Having enveloped my heart and mind with thoughts of God's love for the sparrow and for me, the Lord allowed my thoughts to soon turned negative. As I held that baby sparrow in my the palms of my hands, there was no escaping the reality that I often do not love others with the same level of care and compassion I showed the baby sparrow. I went from a state of worship and praise to a state of remorse and repentance. And my Father in heaven chose to discipline me in a way and in an area I did not expect, although I should have. He brought me face-to-face with how I have, at times--too many times--fallen short of loving my Christian brethren on social media (i.e. blog posts, Facebook, and Twitter). Respectfully, I am going to take the last word on this thread. Pastor, thank you for your compliment regarding my book; although it would have come across as more genuine had the compliment not come as a precursor to make a point about another book you are trying to defend. For the second time: I have read [his] book . . . and I was encouraged by it. Pastor, I have not missed your point. I understand what you are saying. But, pastor, you have taken what I intended to be an encouragement to specific friends who I know struggle with the idea of living up to real or perceived unbiblical expectations being placed upon them--either by well-intended Christians who insist its a cop-out to be content with the gospel opportunities the Lord provides them, in the context of the present life they are living, or by themselves as they lack contentment with where the Lord has them because they are bombarded on Facebook and other places with the exploits of other Christians doing exciting things in seemingly exotic places--you have taken my sincere effort to encourage others and you've made it dirty. Instead of giving me the benefit of the doubt, instead of allowing the post to stand as intended, you have used my post as a bully pulpit to excoriate an article with which you intensely disagree. In the process, you have all but stripped the post, my post, of its encouragement. While I'm disappointed, I am also grateful. And I mean that. You should hear no sarcasm in my words. I am grateful because as I've followed your participation in this thread, I have held it up as a mirror. And in the mirror I have seen myself. In this comment thread, I have seen every time I have done what you have done here. Every time I was well-intended. Every time I wanted to either set the record straight or correct what I thought was a wrong point of view. Sadly, most times (and I only speak of myself) there was part of me that looked forward to the debate with my Christian brethren. In fact, I have not only commented on the posts of others with the before-mentioned intentions; I have written post, tweets, and lengthy articles with the before-mentioned intentions. Pastor . . . the Lord has used you in my life, today. And again, I am NOT being sarcastic. I am thankful to both you and the Lord. As a result of reading your comments, studying for an expository sermon I am writing about 1 John 4:7-10, talking to David (a 50-year-old drunk, homeless veteran) on a street corner I had never before today visited, and finding a baby sparrow on the ground and rejoining it with its mother--a strange convergence of circumstances, indeed--I am convinced that but for extreme circumstances (matters of life, death, and the gospel) I should never again write a negative FB post or comment, blog article, or tweet about another brother or sister in Christ. If a situation arises in which I feel I must publicly critique something someone said or did publicly, I will do so with fear and trepidation instead of exuberance. May God keep me from EVER having a desire to win the argument without concern for winning my brother. It's far too easy for me to sin online, through social media. It's far too easy for me to fail to extend grace, benefit of the doubt, patience, and love to those who are supposed to be my brothers and sisters in Christ. It's far too easy for me to feed my flesh, the old man with his critical spirit, by writing on FB, Twitter, and blogs. It's far too easy for me to find personal satisfaction in being right and making sure others know they are wrong and using social media to feed the beast. I've tried to leave social media, but the ministry to which the Lord has, for the moment, given me stewardship requires I engage others through social media. Leaving social media isn't the answer for me. Growing up is the answer for me. Again, pastor, I am talking about ME. I am NOT describing myself to serve as some sort of back-handed, critical, metaphor for you. I do not know your heart. I humbly ask that you take me at my word, sir. God is so very good. I thank Him for doing something today that has only taken me by surprise. Oh, what little faith I have that I am still surprised when my Lord works in my life! The pastor, after reading the above, apologized to me. It seems the Lord is allowing both of to grow, and for that I am grateful. Only a sovereign God who loves those He has created in His image and adopted into His most beloved family, through repentance and faith in His Son Jesus Christ, would both cause and allow me to examine my love for my Christian brethren through the lens of the spared life of a baby sparrow. A baby sparrow and my Christian brethren: before last Wednesday there was no reason for me to think there would ever be a relationship between the two. Now, by the grace of God, the two are inseparable.